This story appears in the June 26 & July 3 print edition of Transport Topics. WASHINGTON — A simplified tax code for businesses and individuals would incentivize job creation and economic growth for industries such as the freight sector, the country’s vice president and top lawmaker in the U.S. House told manufacturers this month. 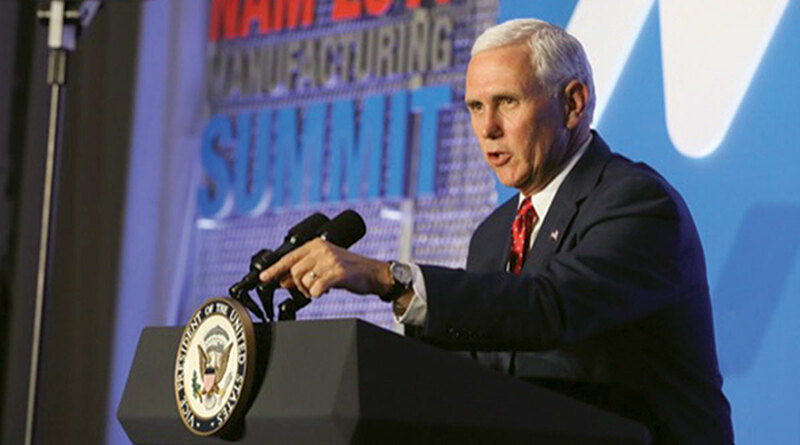 After Congress and the Trump administration sign off on a replacement for the Obama-era health care law, Republicans will aim their focus on adopting the “largest tax cut since the days” of President Reagan, Vice President Mike Pence said June 20 at the National Association of Manufacturers’ annual summit. Pence frequently referred to potential benefits associated with cutting taxes and explained that a tax reform bill would reflect the administration’s blueprint of reducing taxes for small businesses and farmers as well as simplifying the tax code. Pence and House Speaker Paul Ryan (R-Wis.) offered little clues about the legislative details in the tax overhaul aimed for passage this year. They agreed the overhaul would pave the way for the administration’s priority of approving a long-term infrastructure funding measure. Instead of crafting separate legislation, House and Senate leaders plan to schedule discussions with administration officials on a tax reform plan. The uniformity would help ensure passage of tax cuts, which could be either permanent or temporary, Ryan explained. The speaker downplayed the limited congressional schedule this year, which impedes major action on reform bills. He also avoided mentioning the proposal of a 20% border |adjustment tax on imports. Ryan instead spoke in generalities and urged executives in the manufacturing sector to view reforms to the tax code with an aspirational mindset. “Help us see this better way. Help us see this better day that if you are put on a level playing field as a manufacturer at the rest of the world, how much better you can do, how many more wage increases you can have, how many more jobs you can fill, how much better this country can be,” Ryan said. Jay Timmons, CEO of the National Association of Manufacturers and a staunch advocate for long-term funding for infrastructure, applauded the speaker’s message on behalf of the group. In March, NAM’s leadership visited with Trump at the White House. The president pledged to boost manufacturing jobs and return to the country jobs that had moved overseas. “My administration is working every day to make it easier for manufacturers to build, hire and grow in America. We’re removing job-killing regulations and lifting the burdens on American industry like, I would say, have never been lifted before. We’ve done a lot of work over the last 60, 70 days, and I think you’re seeing some real production,” Trump told the group at the time. Last week, more than 250 members of the House signed a letter that urged the leaders of a tax policy panel to adopt a sustainable funding source for the Highway Trust Fund as part of a tax reform package. The trust fund relies on dwindling revenue from fuel taxes. Transportation policy writers in the House are expected to consider a long-term infrastructure bill this fall. That would coincide with the administration’s unveiling of legislative details for a $1 trillion, 10-year infrastructure plan. To advance legislation that would include the trust fund, the authorizers would need approval from the leaders of the Ways and Means tax policy panel. NAM and the freight industry have called on Congress and the White House to approve an increase in fuel taxes to help states pay for upgrades to roads and bridges. The trust fund relies on the federal 24.4 cents-per-gallon diesel tax and 18.4 cents-per-gallon gas tax. The federal fuels tax has not been increased since 1993.